Forget it. It doesn’t matter. The title’s the least of it. . . It isn’t a book anyway, it’s just a kind of investigation into a life. Angle of Repose — that is, the novel that Wallace Stegner has written, not (necessarily) the non-book Lyman Ward contemplates — is exactly that, an investigation into a life. But whose life? Ostensibly, it explores the life of Lyman’s grandmother, illustrator and writer Susan Ward, reconstructing it from sources including her letters and notebooks as well as her published writings and drawings. And a very interesting life it is, too: from an elegant, cultured existence in Brooklyn Heights, surrounded by sophisticated people and domestic luxuries, she moves west with her engineer husband Oliver to places that, in the 1870s, were still works in progress as outposts of American “civilization.” As jobs come and go and hopes rise and fall, they move around, from California to Colorado, from Idaho to Mexico, each time in a new way re-establishing themselves as at home. They came out onto a plateau and passed through aspens still leafless, with drifts deep among the trunks, then through a scattering of alpine firs that grew runty and gnarled and gave way to brown grass that showed the faintest tint of green on the southward slopes and disappeared under deep snowbanks on the northward ones. The whole high upland glittered with light. I wish I could make you feel a place like Kuna. It is a place where silence closes about you after the bustle of the train, where a soft, dry wind from great distances hums through the telephone wires and a stage road goes out of sight in one direction and a new railroad track in another. There is not a tree, nothing but sage. As moonlight unto sunlight is that desert sage to other greens. The wind has magic in it, and the air is full of birds and birdsong. Meadowlarks pipe all around us, something else — pipits? true skylarks? — rains down brief sweet showers of notes from the sky. Hawks sail far up in the blue, magpies fly along ahead, coming back now and then like ranging dogs to make sure you are not lost. Not a house, windmill, hill, only that jade-gray plain with lilac mountains on every distant horizon. The mountains companionably move along with you as the dirt road flows behind. The plain, like a great Lazy Susan, turns gravely, and as it turns it brings into view primroses blooming in the sand, and cactus pads with great red and yellow blooms as showy as hibiscus. I’m not at all a “roughing it in the bush” type, but often reading Angle of Repose I wished I could step outside into the fresh air of a pine forest and dabble my feet in a rushing brook. The people in the story, Susan and Oliver in particular, are as vivid and three-dimensional as their surroundings, and the story of their marriage — which survives, despite frequent separations, repeated disappointments and disagreements, tragic loss, and personal betrayals, for 60 years — is full of insight and human drama. But ultimately this biographical story is neither the most important nor the most interesting aspect of Angle of Repose. For one thing, it’s embedded in Lyman’s own story: the dream sequence near the end makes even clearer what has been implicitly evident all along, which is that Lyman is investigating his grandmother’s life as a way of trying to understand his own. Crippled by disease, confined to a wheelchair, in near-constant pain, increasingly dependent on others’ care and fearful of losing what autonomy remains to him, Lyman finds in the activity of his mind both distraction from and consolation for the limitations of his body. Forced to retire from his work as a history professor, he can at least pursue his vocation as a historian, and in a manner that also provides him with a way of reflecting, by proxy, on his failed marriage, his relationship with his son, and the inevitable constrictions of his future. In Lyman’s story too there is much insight and even some drama — though that, for him, often borders uncomfortably on farce, and his wry self-awareness keeps pathos at bay. If he is working with correspondence, as I am, and with the correspondence of a woman to boot, he will wade towards his little islands of information through a dismal swamp of recipes, housekeeping details, children’s diseases, insignificant visitors, inconclusive conversations with people unknown to the historian, and recitations of what the writer did yesterday. All full of pious renunciations, he says, everything covered up with Victorian antimacassars. He cited me her own remark that she wrote from the protected point of view, the woman’s point of view, as evidence that she went through her life from inexperience to inexperience. Rodman has inadvertently stumbled on another issue that has also been written about extensively: the way in which ideas of “historical significance” have traditionally been gendered. Lyman himself is well aware that the “real” history is happening somewhere else while he stays at home with Susan Ward: over and over Oliver and his colleagues ride off to do manly work (“They departed like a Crusade,” observes Susan at one point) but it’s her perspective we share, and Stegner often makes the point that she too, with her home-making and domestic chores, but also with the cultural aspirations she carried with her and the drawings and stories she created to build bridges of understanding between East and West, was engaged in building a nation. It’s just that her experiences could easily be dismissed, as Rodman dismisses them, as “inexperience,” an error Angle of Repose corrects simply by paying attention to them. i learned that history is the real story the city fathers tell of the only important events in the world. a tale of their exploits hacked out against a silent backdrop of trees, of wooden masses, so many claims to fame, so many ordinary men turned into heroes. (where are the city mothers?) the city fathers busy building a town out of so many shacks labelled the Western Terminus of the Transcontinental. Gateway to the East — all these capital letters to convince themselves of its, of their, significance. What interests me in all these papers is not Susan Burling Ward the novelist and illustrator, and not Oliver Ward the engineer, and not the West they spend their lives in. What really interests me is how two such unlike particles clung together, and under what strains, rolling downhill into their future until they reached the angle of repose where I knew them. That’s where the interest is. That’s where the meaning will be if I find any. That “angle of repose” seems to me something that Stegner achieves, not just for his characters, but for the historical and fictional imperatives that underlie Angle of Repose. *Jackson J. Benson’s introduction to my Penguin edition explains the permutations of Stegner’s negotiations with the Foote family. Previous Article June Updates: a New Open Letters Monthly and a Fun Q&A! What beautiful sentiments. I second them all! Stegner’s work struck a resonant tone with me. My parents were a geologist and a botanist, during their early years of marriage, from 1941-46 they spent their time evaluating mines in the West. Their’s was a hardscrabble life much like that of Susan and Owen. Like Susan and Owen they weathered a long series of unanticipated storms. So many relationships start out with short-term promise but then either languish or flourish with age. It is fascinating to peek into the lives of Lyman’s Grandparents and at the same time view the current reality of Lyman’s desperation with his age, frailty, dependance, and fragmented relationships. I love the concept of the angle of repose as applied to these complex relations. Any strong relationship evolves, it’s persistence is clear evidence of the evolution. I think this is one of the most complex and intersting books I have ever read, like the previous commenter I wish I could read it again for the “first time”. The people in my reading group (all excellent readers) were surprised when I said this at our meeting, as they were far more focused on the novel as the story of Susan Ward. 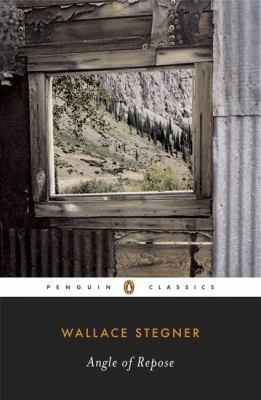 Anyway, this was a remarkable book in so many ways (my first Stegner), and I’m glad to have your thorough take on it.